Dechlorination of eutectic LiCl–KCl based electrorefiner (ER) salt is reported via ion-exchange reaction with protonated ultrastable Y-type (USHY) zeolite bound into mechanically fluidized 45–250 μm diameter particles. Evidence of exchange of cations from the salt (Li+, K+, and fission product cations) into the zeolite lattice replacing H+ ions was found based on a change in unit cell size, ICP-MS, XRD and TEM–EDS in addition to detection of HCl off gas. Ion exchange reaction was carried out at 625 and 650 °C, temperatures above the melting point of eutectic LiCl–KCl. Experiments were carried out to optimize zeolite drying temperature, estimate maximum ion-exchange capacity, and determine the thermal stability of USHY zeolite. The results indicate over 90% dechlorination can be achieved without zeolite structure collapse at 625 °C. 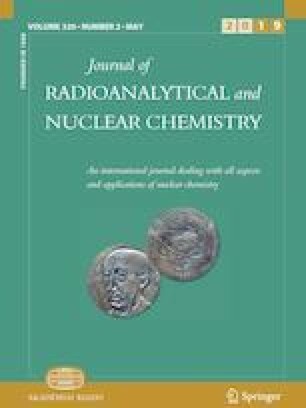 This provides a promising route to stabilizing waste from radioactive chloride salts into dechlorinated waste forms for permanent geologic disposal. This research has been funded by the U.S. Department of Energy through the Nuclear Energy University Program (Project 16-10190).